The product packaging incorrectly states that it has a smooth bore barrel. 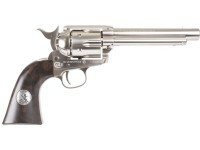 The Duke pellet revolver has a rifled barrel. 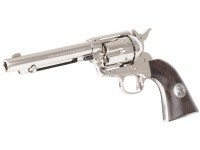 Silver screen gunslinger John Wayne is one of the most iconic figures in American culture and the Colt Single Action Army (SAA) revolver he carried remains among the most popular reproductions. As the Oscar-winner Rooster Cogburn in True Grit, and in almost half of his 200 silver screen appearances, Wayne carried his trusted Peacemaker. Together, the Duke and his six-gun captured imaginations and personified the Old West. 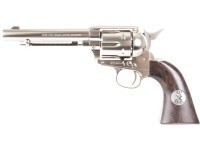 In recognition of the timeless appeal of the Colt SAA and an admiration for John Wayne as symbols of American gun culture, the new Duke Colt Single Action CO2 Revolver is a faithful replica of the classic six-shooter. 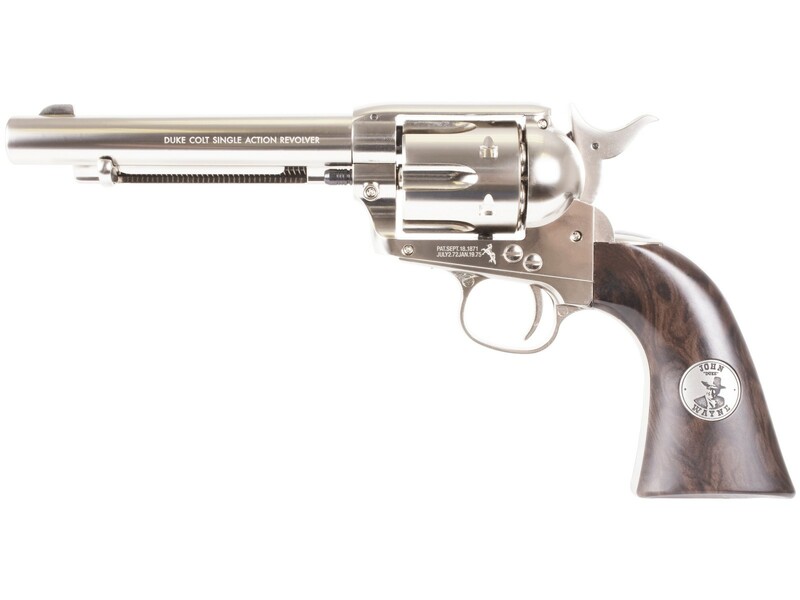 The CO2 revolver shoots .177 caliber pellets, features authentic action, a full metal frame in various appealing finishes, and handsome, composite grip panels that include an inlaid medallion detail of the Duke himself. John Wayne's signature is on the back strap of this collector's gun, and you can choose from three attractive and distinctive finishes. The single action revolver is powered by CO2, and the 6-round cylinder has a working ejector rod for added realism and convenience. Add this American treasure to your collection today and feed your hunger for iconic guns. Does anyone know where this revolver is made? I don't buy Chinese made products. How long is barrel on this revolver ? 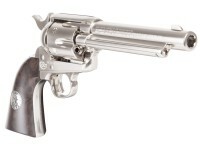 I would like a pellet peacemaker, even at .177...but don't want these John Wayne grips. I have the BB.177 Peacemaker. Would its white grips be interchangeable with the Wayne grips?